Nashville is THE place to go if you consider yourself a foodie! There are all sorts of fun and unique local restaurants. Everything from fried chicken to ramen to breakfast foods. Here are a few of the spots you can’t miss! Last week, I got to check another state off my list of places to go: Tennessee. My brother moved to Nashville a few months ago, so Andrew and I took a long weekend to visit him. 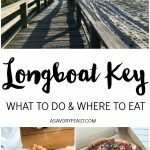 While we were there, we got to do a lot of exploring and try a few local restaurants! I’m sharing my favorites with you today. 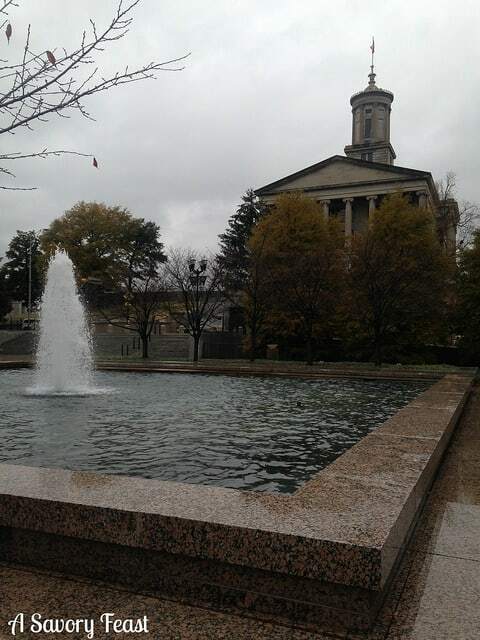 We actually didn’t do a lot of the tourist-y things in Nashville. Next time, I am planning to visit the Parthenon, go to the Country Music Hall of Fame and explore the Grand Ole Opry. Even without visiting those tourist attractions, we were able to find some fun and inexpensive things to do. 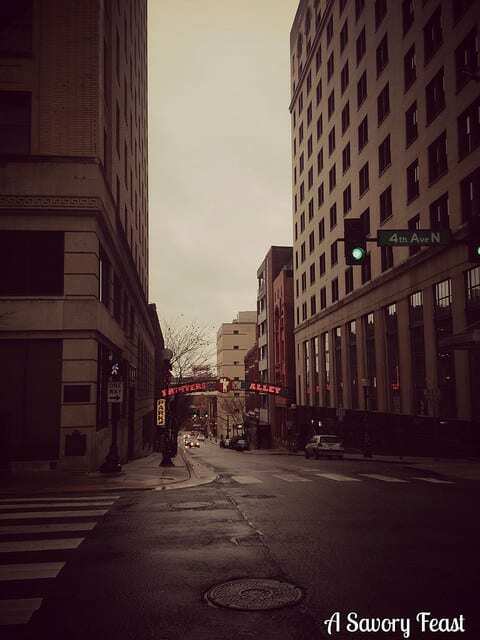 We spent one morning walking around downtown after breakfast. There are plenty of places to go and things to do, but we just explored. You can walk down Printer’s Alley, check out the State Capitol building, and see lots of historic buildings without paying a dime. If you’ve got some time to kill or want to do some shopping, the Mall at Green Hills is the perfect place! Andrew and I drove through the night to get to Nashville, so the following day we were both pretty tired. We spent a chill afternoon strolling the mall and went to see Mockingjay at the theater. I loved visiting the mall this time of year! It was all decorated for the holidays and looked so festive. It was much bigger and fancier than any of the malls near me, so that was exciting, too. Okay, so this one isn’t technically in Nashville, but it’s worth the 1 1/2 hour drive! 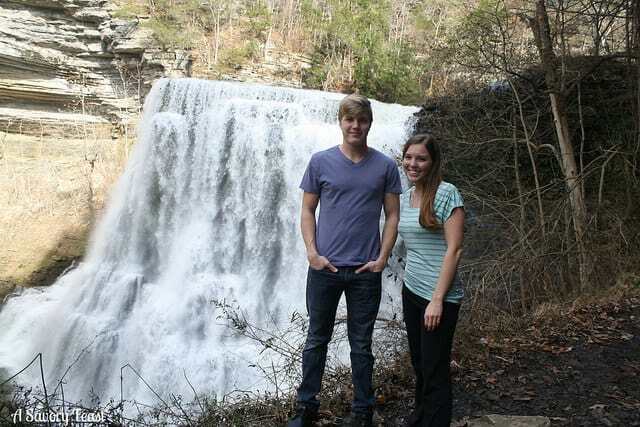 When Andrew and I were planning a Fall trip, we knew we wanted to do some hiking and see waterfalls. 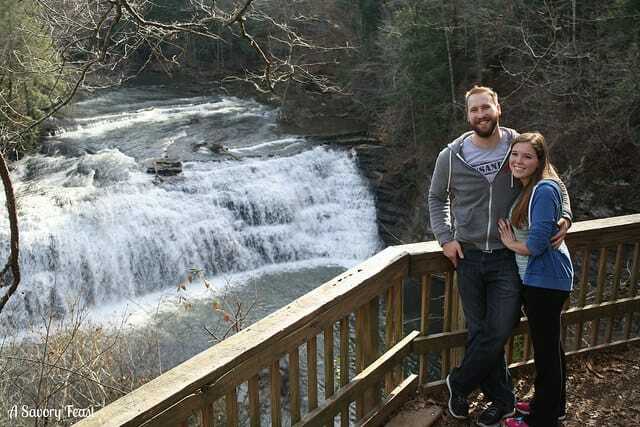 I came across the website for Burgess Falls when we were deciding what to do one day. 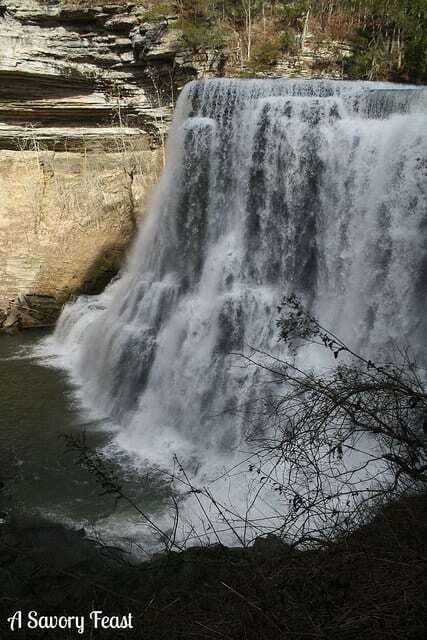 You get to see FOUR waterfalls at Burgess Falls, ranging from 20 feet to 136 feet. There are also lots of other sights to see during the short hike. We were so glad we decided to visit the falls during our trip! They were absolutely gorgeous and we got a nice workout in, too. I took so many pictures, and I wish I could share them all with you! Indulge me and check out a couple more… Isn’t this the most beautiful place? You already know that Andrew and I love to eat. I mean, I do have a food blog after all! We love trying new restaurants in our hometown of Sarasota, but it was really exciting to get to visit some new places in Nashville. We tried all sorts of food, from burgers to sushi to steak. To be honest, this trip turned into a food adventure. Our days revolved around where we would eat, and we talked about food almost the whole time. I’m told that a huge part of the Nashville experience is the food, so I guess it was the perfect trip for us! Nashville has forever spoiled me for coffee houses. We just don’t have anything like them in Sarasota! 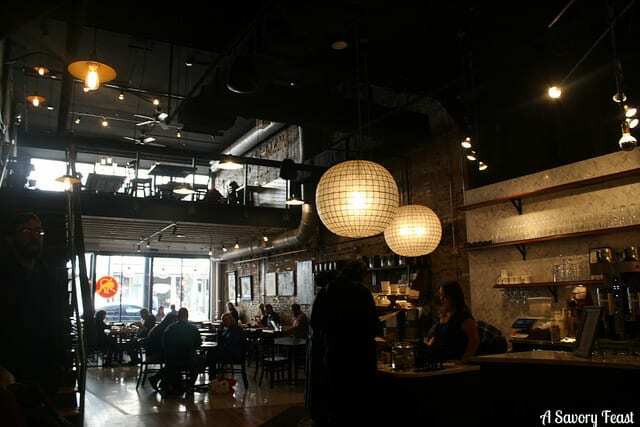 Not only did the Frothy Monkey have amazing coffees (like my favorite, the Turtle Latte), they also serve breakfast, lunch and dinner and have a selection of wine, craft beers and cocktails. If you stop in for breakfast, I highly recommend the “Bob.” It comes with two whole-wheat pancakes, house-made syrup and your choice of sides (I went with bacon and eggs). The pancakes almost taste like they are good for you! You HAVE to get some southern food while you are in Nashville. 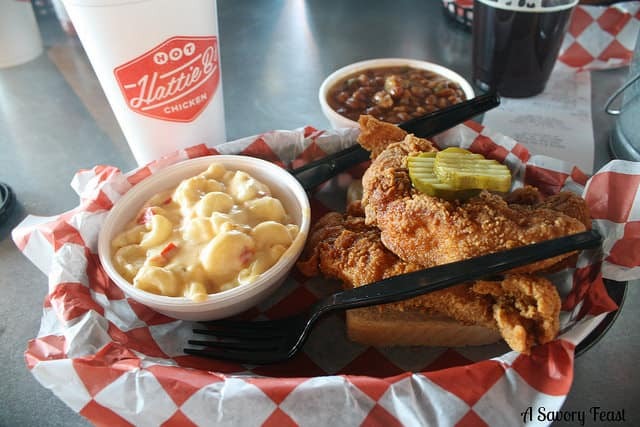 Hot Hattie B’s is a delicious place to get fried chicken and all the fixins. I got their Pimento Mac & Cheese and Baked Beans on the side. It’s comfort food at it’s finest! Andrew wanted to visit a steak house while we were there. I did some research and found Chateau West. After seeing the picture of the building, I had to go! It looks like it belongs in a ski resort in the mountains. It’s a French restaurant, and they serve steak and seafood. Be sure to make a reservation and dress up for dinner at Chateau West. We started our meal with escargot, which was delicious! For my meal, I chose the Scallops a la Richelieu. They are served in a lobster bisque, which complements the scallops perfectly. Andrew has been wanting to try an authentic ramen restaurant for awhile now. We haven’t found one near us yet, but we were able to find one in Nashville. It was such a fun experience! We love trying new types of food, and this was definitely something we will do again. We started with an appetizer of Pork Belly Buns. I had never tried them before, so I had no idea what to expect. They were so good! 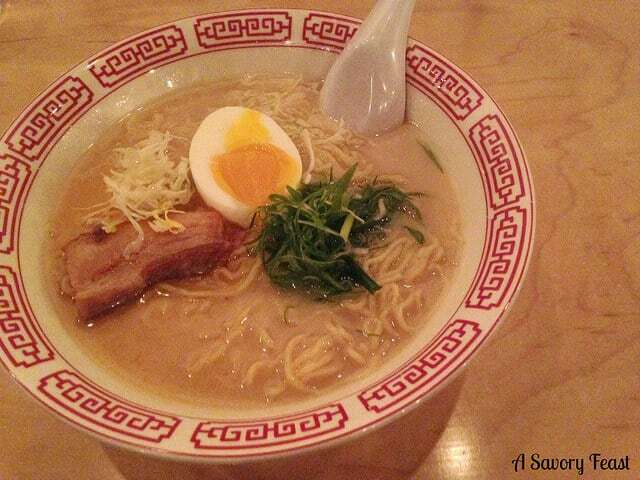 Our ramen was so flavorful and delicious. I got the Assari Shoyu, pictured above. I was told it was a traditional ramen, so it was a good place to start. We met up with some friends for burgers at M.L. Rose. They have so many craft burgers and unique sandwiches. I got the Nite Owl, which was unlike any burger I’ve ever had before. It was a savory combination of smoked tomato jam, stout braised onions, bacon and cheddar cheese. Yum! 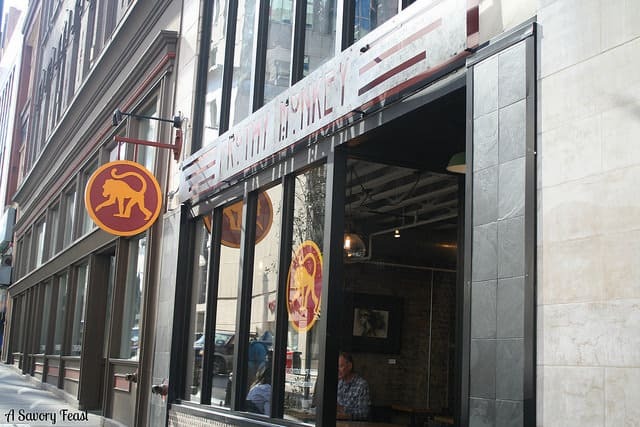 If you are looking for a place to try some of Nashville’s local craft beers, this is it! 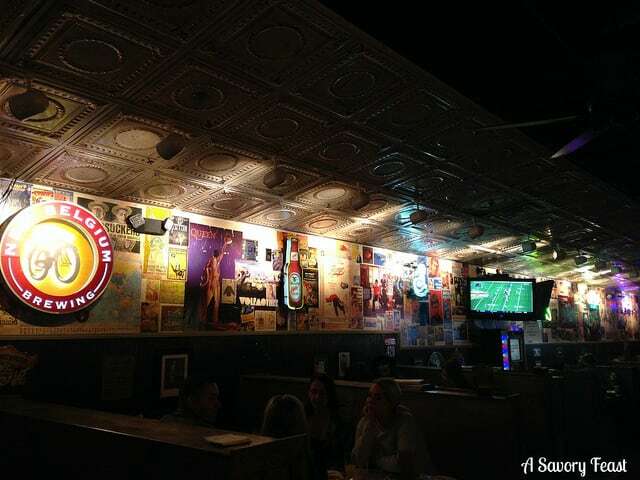 Their drink menu is gigantic and features lots of beers on tap and in cans and bottles. They also have several types of ciders. One of my favorite things about vacations is going out for breakfast. One morning, we visited this European-style cafe. I loved that they use seasonal and local ingredients! If you aren’t from the south, you probably don’t understand our obsession with grits. I love them! My breakfast included a bowl of Gruyere Cheese Grits. Easily some of the best grits I’ve ever had! I’m going to have to buy some gruyere cheese for when I make grits at home. Have you ever been to Nashville? What are some of your favorite places to see and eat? I was not compensated in any way for this trip or any of the recommendations here. All opinions are my own, and I am sharing these restaurants and places to visit because I enjoyed them. Previous Post: « It’s My 1st Blogiversary! We have lived in Nashville for about a year and are constantly trying to find new restaurants to try out! Thanks for the suggestions! How do you like living there? I really liked the area! I hope you get a chance to try some of these places soon. Nashville is a pretty happening town. I’ve passed through there a couple of times when I lived in Atlanta and would travel to Little Rock. I would always stop right outside the city. If I am ever in the area again, I’d definitely check out the recommended restaurants. I really enjoyed visiting! Hopefully I’ll get to go back soon, too. Yes I also visited Nashville for the first time this year! I love that it’s a Foodie town and have a post on places to eat there. My favorite was Pancake Pantry! We did the hop on and off bus and even without a lot of hopping it was a great way to see the city. Looks like you had a lot of fun and great eats!! I’ll have to try the Pancake Pantry next time, that sounds so good! And the hop on and off bus seems like a smart way to get around. 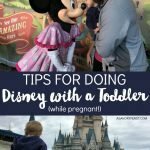 Thanks for sharing your tips! I was wishing I could get some more of that coffee this past weekend! You should definitely visit Nashville if you ever get the chance. 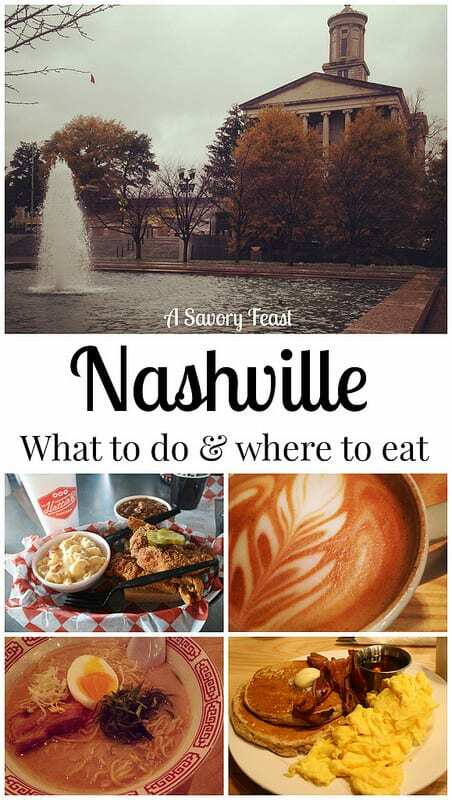 I’ve heard Nashville is awesome and this post makes me want to visit even more! One day, hopefully! I hope you get to go soon! It was so much fun to see. You’ll have to let me know what you discover when you visit Nashville. I could go for some Hot Hattie B’s right now. Reading about all these restaurants makes me hungry!! I absolutely love Nashville, it’s just a really fun city! When you go back you HAVE to go to Grand Ole Opry, it is absolutely stunning on the inside, especially this time of year. You could spend hours in that place!! I was wanting to go, but we weren’t able to fit it in. Next time, for sure! I had a lot of fun! Thanks for stopping by and reading all about it. Food is my absolute favorite part about visiting a new state! Thanks for all the suggestions. They all look wonderful! I’ve only been to Tennessee as a small child, but I love the south and am definitely planning on going back in the future! I love going on food adventures! Nashville is an amazing place to try new restaurants. Ahhh, I had no idea we were so close to you! Next time, for sure. Nashville is up there on the list of next Vacation spots, and this post may have just pushed it to the top. 🙂 How fun! Thanks for sharing Jenna! You should go soon! It was a great experience. The city has a lot to offer. I lived in Nashville for 10 years and my parents still live there. It really has it’s own unique personality. My parent’s favorite coffeehouse is “Fido’s” and they have an absolutely divine hot chocolate too. If you ever go again, you absolutely must visit the Grand ol’ Opry Hotel. We used to go every year during Christmas and it is magical. Waterfalls, an indoor Rain Forest, Boat rides in the river delta and decorations galore. You can spend all night just walking around and it’s free. It’s pretty crowded at christmas though. Thanks for the memories! I’m definitely going to check that out next time I’m in Nashville! Hopefully I’ll get the chance to go back soon. Looks like you had a great trip ! Now I know at least a little so that it doesn’t sound new to me if I make a trip to Nashville. Thank you for linking up at Bloggers Brags. I’ve pinned your post to Bloggers Brags Pinterest Board. We would love to see you again next monday. 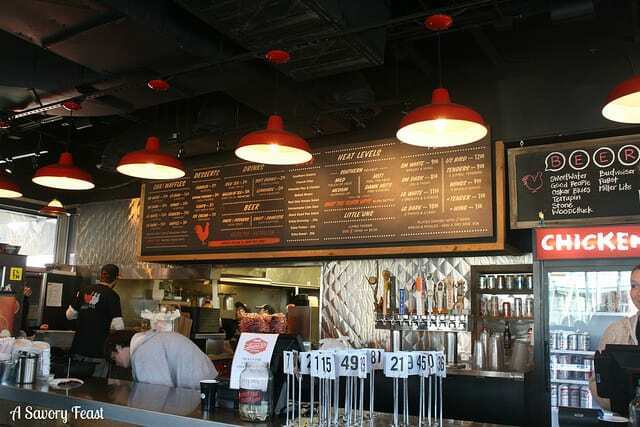 If you want to try the original ‘hot chicken’, you must visit Prince’s Hot Chicken Shack. The Prince family created hot chicken back in the 1930s. Prince’s is really a dive place and in a ‘not so nice’ area of town so visit for lunch. Even then expect it to be packed. And definitely see a show at The Ryman. They always have a full schedule of music. If you are there in the winter, the Grand Ol’ Opry is at the Ryman, which is where it began. Thanks for sharing these ideas! I need to add them to the list of things to do next time I’m in Nashville. I would love to go back one day soon. Barista Parlor in the 5 points area is BEST coffee & breakfast. Coffee counter looks like a science experiment in process, jams/jellies are homemade, sausage comes from butcher next door, nice patio area w/live music in warm weather (and some great shopping in the area. City House Pizza, Rolf & Daughters (get yourself a spot at the bar and have dinner so you can watch the amazing bartenders at work) or Lockland Table for dinner, Fido’s on Vanderbilt campus for breakfast. Check out The Gulch and go to Two Old Hippies. Music at a place called The Basement was stellar. We are heading there again in April to see the Decemberists at the Ryman and The Apache Relay at a place called the Exit/In. Thanks for all these ideas! I would really like to take a trip back to Nashville again one day. There are so many amazing foods to eat. 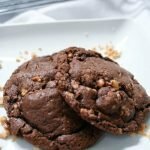 You also have to try Jenni’s! Its an ice cream parlor and she has the weirdest/ random but delicious combinations of ice cream like avacado and chocolate! That would be so much fun! I need to go back one day soon. Ah Nashville. What a fun place! We were there over a year ago for Thanksgiving, but didn’t get to do a lot around town. I hope to explore more next time. I had so much fun on this trip! It was really fun to explore and try local restaurants. My brother moved so we will have to come up with another excuse to go there again! Spent many weeks during the summer there!! Love eating at the Loveless Cafe, the history is fabulous. Also love going to the Ryman, the Parthenon, and the Country Music Hall of Fame! Puckett’s Grocery is also a fantastic place to eat!!! I’ve been wanting to go back again! Still so many wonderful places to try. Nashville is such a great place to try local restaurants! We still talk about the places we ate all the time. 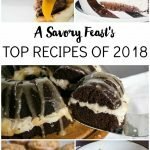 I didn’t try any of these places you recommended, but I’ll add them to the list for next time! So many great restaurants in that city, for sure! I think I’ll keep trying different ones each time I visit. The Red Bicycle crepes! So yum! I’ve been compiling a list of places to go next time! Crepes sound amazing. I’m visiting Nashville next month for my bday and I’m super excited and can’t wait to see what new adventures I come across while I’m there! Hubby is a big foodie so all these great ideas are awesome and I’m jotting them down on my “to do” list. Thank you!!! You will love Nashville! I had so much fun and can’t wait to go back. It’s definitely the place to go for foodies. I’ve always wanted to go! You’ve got to go someday! It’s such a fun place to visit. LOVE this, Jenna! 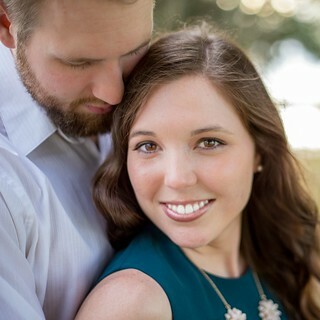 We used to live in Nashville, and your post brought back a ton of good memories. That photo of Printer’s Alley? My office was right next to where you took the photo! And we lived very close to the mall! Ah. Love it so much! That is awesome! We drove through some neighborhoods near the mall and it was so pretty. I love it there!